The name of Whitchurch may originate from the old English word ‘Witcirce’ meaning ‘white church’ indicating the building was made using the local chalk or possibly white-washed. Archaeological excavations to the north-west of the town revealed a site of Iron Age and early Roman occupation with indications of rural industry related to Agriculture. The ancient Roman route of the Harroway runs to the north of the town. The Roman road links Whitchurch with the Roman settlements in Londinium, Calleva, Venta and Sarum, (London, Silchester, Winchester and Salisbury). In 1999 a dig to the North West of the Town found evidence of occupation from the middle Iron Age to early Roman times; the details are here. The Manor of Whitchurch was first mentioned in a charter of 909AD, when King Edward the Elder confirmed the land to the monks of Winchester. In the Doomsday Survey of 1086, William the Conqueror’s Census the Bishop of Winchester is listed as holding Witcerce; three mills are mentioned with the town being worth about £35. The principal medieval trades within the town seem to have been brewing and baking. In 1132 a large parcel of land in Witcerce was gifted by Henry de Blois to the Hospital of St Cross. It’s possible that the earliest settlement lay near the church and a ford crossing over the River Test. In 1241 Winchester Priory obtained a Royal grant for a weekly market. The Prior of St Swithun, John De Cauz, issued a charter for a borough in Whitchurch around 1248, with the same status and privileges as Portsmouth. This borough charter was confirmed in 1284 and again in 1285, and Whitchurch was governed by a Court Leet which met each October. The town seal is still held at the Town Hall. Whitchurch later passed back to the Prior and Convent who held it until 1541, when it transferred to the Dean and Chapter of Winchester, with whom it then remained. Whitchurch suffered the loss of nearly half its population during the Black Death plague of the 14th century. The population turned from intensive arable farming to rearing sheep – an animal that fared best on the chalky grasslands surrounding the settlement. With the sheep came the associated growth in the cloth industry and the use of mills for some of the cloth manufacture. It wasn't until the 17th century that the population fully recovered from the ravages of the plague. In 1586 Whitchurch returned two members to Parliament. King Charles I and his troop stopped at Whitchurch in 1644 on their way to the Battle of Newbury, and in 1649 the local people sent a complaint to Lord Fairfax concerning the considerable losses they had sustained when Colonel Martin's soldiers were stationed there. In 1696 William III granted two fairs to Whitchurch and by the 18th Century four fairs were being held. The focus of the town was the town square with its five roads junction. A map of 1730 shows a Market Hall in the middle of the Market Place. At that time the north-south Newbury to Winchester road was a turnpike and the White Hart was a coaching inn. The Huguenot refugee Henri de Portal and his family arrived in 1712 having escaped religious persecution by hiding in wine casks on board a ship which sailed out of Bordeaux. The family brought the skill of their paper making trade to nearby Freefolk where Henri opened his first mill at Bere Mill on the River Test which has qualities eminently suited to paper making. The industry flourished, later moving upstream to Overton where high quality water marked bank note paper is still made today. Henri Portal is buried here in All Hallows church. Local industry in the 18th and 19th centuries included flour milling, silk manufacture and the production of woollen cloth. 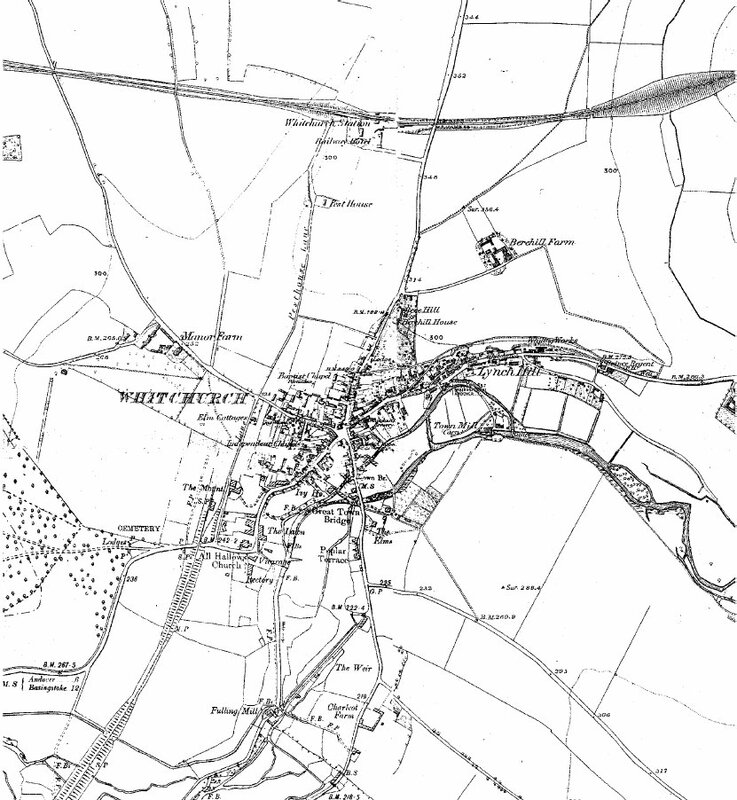 A map of Whitchurch in the late 19th Century is here. The town has changed its status several times in the last 200 years, these can be found here and there is a fount of statistical information about the town during that period here. In the first half of the 19th century William Cobbett noted travelling through Whitchurch on 3 occasions. Apart from his descriptions of the Test and the countryside, he was particularly impressed with the effect that the paper produced at the mill of 'Squire Portal' had on the world economy. The quotation are to be found here. Towards the end of the 19th century, the Salvation Army and its open-air services were the dominant talking point. They maintained that they had a right to hold these services but were prosecuted for obstructing the highways and causing a disturbance. The conviction in 1889 of one group, and their subsequent treatment by the authorities, led to demonstrations. In October 1889, 800 Salvationists with their bands demonstrated in The Square at Whitchurch. 80 were arrested and charged with riot, unlawful assembly and rout; they applied for the case to be heard in the High Court of Justice as they felt they would not receive a fair trial in Winchester. In July 1890 the court found in their favour and set down laws granting the public the right to hold orderly public demonstrations, which were the rules followed until the beginning of the 21st century, when the government overturned them. The railway came to Whitchurch on 3 Jul 1854, when the current station was opened on the new London & South Western Railway line between Basingstke and Salisbury. On 4 May 1885 the Great Western line between Newbury and Winchester came in to being with Litchfield and Whitchurch Town stations being opened. As part of the nationalisation of the railways, the current station was renamed Whitchurch North on 26 Sep 1949. On 7 Mar 1960 Litchfield and Whitchurch Town were closed to passenger traffic. Litchfield closed completely on 13 Aug 1962 and Whitchurch Town was the last station between Newbury and Winchester to close on 6 May 1963; the line was closed and a part of the route was put to good use when the A34 bypass was built in 1976. The last change was when Whitchurch North reverted to its original name of Whitchurch on 2 Oct 1972. Details of historical finds in and around Whitchurch are to be found on Hampshire County Council's website. Photographs of old Whitchurch can be seen on the archive pages of the Whitchurch Parish Magazine.